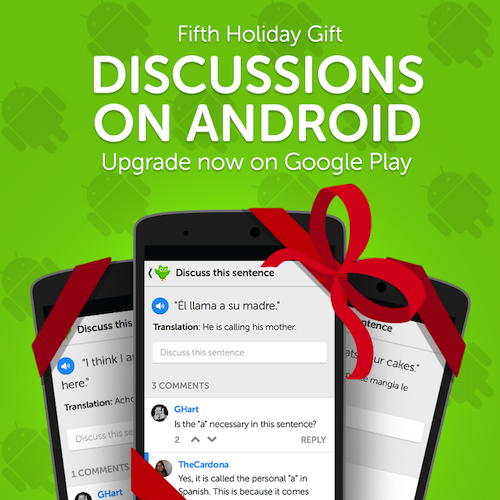 Fifth Gift: Sentence Discussions on Android! Android users, our fifth holiday gift is dedicated to you. Also, you can now practice skills even when they're at full strength and report problems. How about that? I hope you will unify the apps later. Bring the Coach to the web and to Android, and bring reports and discussions to iOS. They said they'll have an update at the end of January for both so I think they will unify them all then. My owl is a pimp. I ain't sad. Same here. I am cracking up every time this dude shows up on my phone. I wish we could buy him more bling with these lingots. One pair of shades ain*t enough. I don't think I could do it without the little guy, he's the best coach ever. We'll finally have the chance to report problems and to understand why we are wrong. I sure hope iOS version is not too far off. Tons of thanks! The best present for Android! Maybe the worst news for IOS users? :) I believe they are working to bring it to IOS ASAP. But fifth? Did I miss the fourth? Oh, the Russian Incubator graduation, that was fourth? This is the best present ever! I definitely think this is the better gift. The app was so frustrating beforehand (as compared to the web version) because of the lack of feedback. This totally saves it. Oh, there is a discussion on this. Just wanted to say you are awesome, duo staff. You really listen to us! Thank you. Thank you! This will make it convenient to see what other users think. Hopefully ios will be able to access this feature in the near future and express their cuteness. Awww.... You said we're cute. Now I feel all warm inside. Haha :-) I was also referencing the post! UPDATED! This is an awesome gift! Thank you! Duolingo is just getting better and better! I'm getting the "Report a Problem" dialogue sometimes (but not always) when I'm just tapping on the text entry field in an exercise, before I even type anything or tap "check". Update: It's also doing it sometimes when I try to tap a multiple-choice response. In that case it seems like it happens when I tap near the upper part of the fourth answer choice, which I believe is where the "Report" button shows up after an exercise. I also get the comments section if I tap to the left of the same spot, where the "Comments" button shows up after an exercise. What device/OS are you using? Thank you. This seems to be a Android 2.x bug. We can reproduce and will work on a fix. This is great news, and I'm kind of glad they can only discuss sentences and nothing else, hopefully only until the forums are improved, and sub-forums or sub-categories are added. Then I believe the floodgates (general discussion) should be opened for all platforms, and we can get information from individuals who are all around the world. Man, am I happy you guys did this. Good move and very well done. Thanks. Thank you so much. Y'all are awesome. This is such an improvement. I can finally really study using the app. Thanks so much for listening. Thanks for the discussion, thank for giving us back the chance to pratice full skills. Keep up the good work. Thanks for not forgetting about Android! Super! :) Thank you and Merry Christmas! Since a view day, i have no discussion on my Android-App. Why??? What was the fourth gift? @duolingo: its nice that you can report now, but it should be also have the option "My answer should be accepted". Click report. It does have the option if you enter an incorrect answer in a text field. @II_AJAX_III have the iPad 2 and the website itself works great so I don't use the app for the iPad. Have you tried that? Reading the comments doubles the time spent and the learning effect! I demand a version for the Commodore 64. Please, Luis, I hope you don't think all of "us iOs users" demand anything. This is not true! Maybe khatsuoi was just being funny or cute so, if I misread his/her meaning, I'm sorry. It's just that I see so many complaints bombarding the Duolingo staff. Some of them don't even ask nicely. I don't know, I guess I just want you to know that some of us see how much work you guys are doing. You didn't have to give us gifts—Duolingo is free! Completely free, no ads and so professional looking and immediate customer service. We didn't pay for any of that. You've said that your main goal is to bring language-learning to people who are not so fortunate. It would be wonderful if everyone in more fortunate circumstances would remember that especially, at this time of year. I'm sorry if this is sounding like a rant. I don't mean it to be. To khatsuoi, I am so sorry if I took your post the wrong way. I just saw the word "demand" and then saw red. Oh no I'm sorry if I put it out that way! Being funny/cute isn't really effective over the internet anyways... haha. I'm super glad for Duolingo as it is. I mean a completely free and wonderful service to us and the community (via translation). Don't worry I completely understand your post so it does not sound like a rant! By the way, would be super if you could make the links in discussions clickable as they mostly point to very useful webpages. You know what I'd like? To get the Fix Error option. Seriously. How long do I have to wait? I'm getting so tired of repeating lessons or reviews because Duolingo feels to need to correct my typos in English and it's really slowing my progress down at the stage I am at. Sorry if this isn't the place for this but I did open a thread for this very question a while ago and as far as I know, no one from the Duo team replied to it. Fix mistakes option is tested, but it only returns you a half-heart if you fix your mistake correctly. What you need is a spell checker, I believe. Thanks a lot for this gift. I's very helpful. But is it possible to make external links work in discussions? Ther's no Discuss button anymore:( I gues it disappeared after app update. Could it be an Anroid issue? That's too bad:( This feature really helps in study. Will it be back? I'm sure it will, only that they are thinking how to avoid the comments and spam of the users. After all, is only temporarily. So, let's just wait. Maybe this month, because they've said that during January they were going to make updates in Android and Iphones. Hey, we've got an update today, but there's no Duscuss button :( May be they just give us a permission to read duscussion. That will help a lot! Sentence Discussions are back on Android! Could we get a timestamp for messages in sentence-discussions?